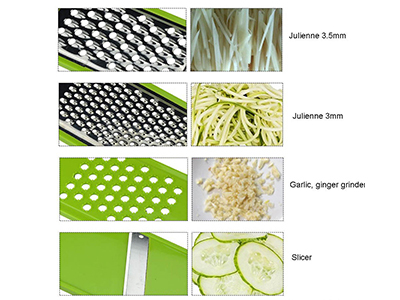 This Vegetable Julienne Slicer is a multifunctional tool.You may use it for cuting all kinds of vegetable and fruits, like carrots, potatoes,cucumber.Make delicious salads within a few minutes. 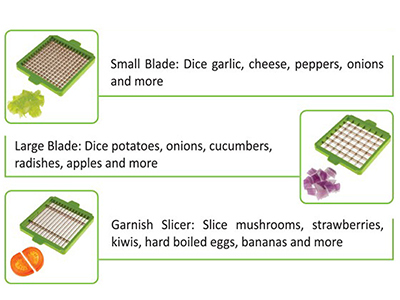 Easy way to cut vegetable into shreds, cutting into small pieces, cut into 4 equal pieces, cut into 8 equal pieces, slicing, dicing, grating, chopping etc..Includes a variety of thick and thin slicing options, fine and coarse grating and shredding options. Easy to clean, easy to use and durable. 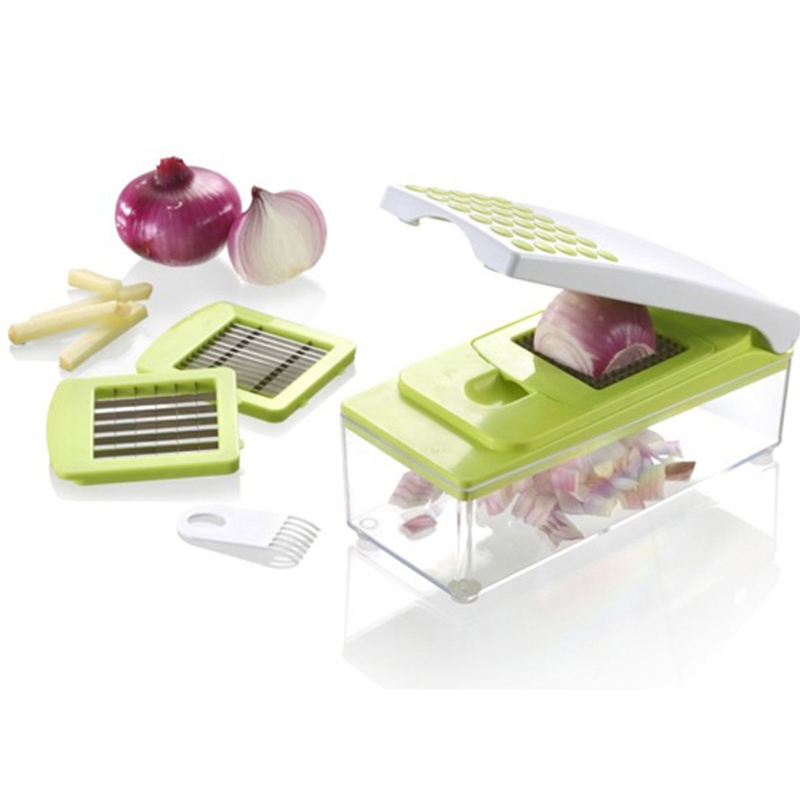 Vegetable Julienne Slicer-Quickly and effortless cut food prep time in half. Very easy to use and all the food falls directly into the collecting container which keeps your kitchen counter clean at all times. 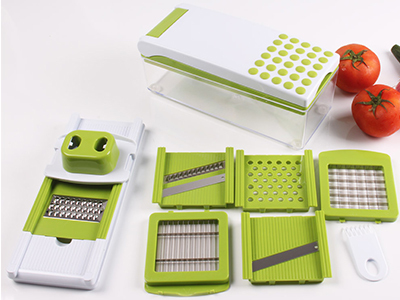 This set is perfect for tomato, carrot,cucumber or onion slices, julienne vegetable strips, waffled potato chips.Also perfect for Garlic, cheese, peppers, onions, potatoes, cucumbers, radishes, mushrooms, strawberries, kiwis, bananas and more. Includes a variety of thick and thin slicing options, fine and coarse grating and shredding options. slice mushrooms,strawberries,kiwis,hard boiled eggs, bananas and more. Now adds more blades to enrich the shape of food and create your delicious. many people are busy for working and have no time to cook a delicious meal. 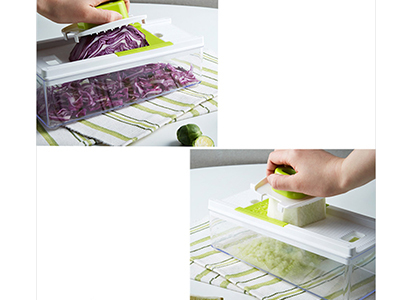 This Slicer is a convenient tool and will help you when you are cooking. 1.This is a high quality Slicer. The blades made of high quality stainless steel that is healthy,sharp and rust-resisting.Our slicer can cut, chop, slice and julienne fruits, vegetables and cheeses. 2.The unique design that has a effective hand guard for protecting your fingers.